Check out Woods' exclusive photo series on Out as well. 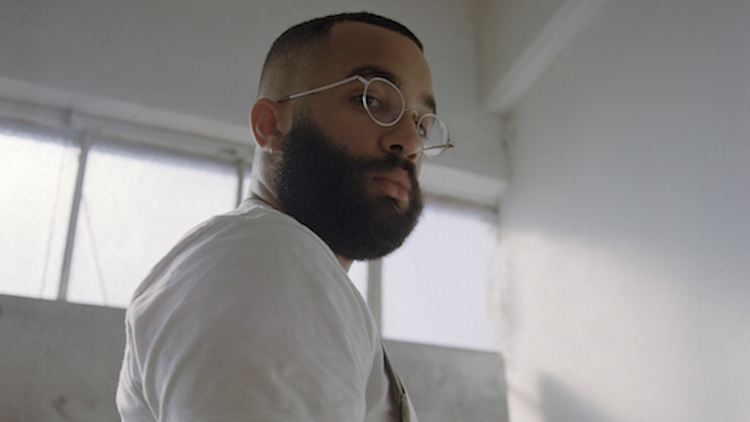 To accompany his gorgeous new photo series capturing fellow West Coast-based artist Santana Bellas, Parker Woods interviewed his subject about his process and the artistic community Bellas has found in the Bay Area. Both photographers capture an incredibly wide range of subjects with a modern touch that feels very raw and candid—and, yes, both have really impressive Instagram grids. Check out their work—@brasshands and @santanabellas—as well as our Out exclusive series of Woods' portraits of Bellas, and then read the pair's conversation below. Parker Woods: Thank you for sitting down with me. PW: You do so many things and have so many irons in the fire: how would you describe your own work and what you do as an artist? SB: My work varies and depends on what the subject is and sometimes also the task. I find that I have the most control creatively when it comes to photography; second to design. I try to make sure that the things I’m doing are capturing life as it comes—documenting it. Also certain projects that I do act as medicine—it’s about healing people. It just depends on what type of project I’m working on, what the subject is, or rather what I’m truly focusing on, and what the message is meant to be. Do you feel like there’s a subject or topic that you have a particular affinity for? I feel like my subjects are so diverse and complex that I try to capture every aspect of them possible. All of the friends and people who I photograph are all so different—coming from different walks of life, different backgrounds. I feel like I have to capture a little bit of everything whether it’s me hanging out with someone in Redwood City or it’s me hanging out with friends in SF, I like working on projects that cover topics from relatable issues to more personal subjects—whether that’s through photography, design, or whatever it may be. But I feel like it’s kind of difficult for me to choose just one subject because I feel multifaceted as a person. A lot of the topics I photograph are wide-ranging. Do you feel the local art , photo, and design scenes in Oakland have been valuable to your growth as an artist? Definitely. My parents were in the military so we moved around so much so I was all over the place from Florida to Indiana, Hawaii to Virginia. When I finally came here to the Bay Area, I was presented with so much diversity and so many opportunities with so much more creative freedom and acceptance. There’s such a strong community here that creating a zine or your own art show is not only possible but you’ll receive support. Being able to truly express myself here has been great and has fostered a lot of development in my art and myself. So find that you do have a sense of community in the Bay Area and that people are pretty quick to show their support of not only you as an artist but of artists all-together? That’s amazing. I want to circle back to when you mentioned that your parents were in the military. I would love to hear your insight on the dynamic of military life and how you feel those experiences affected you. My mom was in the Army and my father was in the Marines so I moved around a lot. I was born in Jacksonville, Florida—was there for about three years—then I moved to Indianapolis, Indiana and was there for six years. From there I moved to Honolulu, Hawaii for three years and then northern Virginia—right outside of DC for two years—then finally to California when I was fifteen and will have been here for ten years in March. Moving around has been a lot. You can’t really hold onto friendships. You’re constantly in a new environment and seeing unfamiliar faces. Being in Indiana and then moving to Hawaii was a huge culture shock. Overall, I wouldn’t change those experiences. You mentioned that there’s a correlation between feeling at home in a place and how you see yourself. Do you feel that calling The Bay home has shaped your view of yourself or that those years of moving around has had more of an influence? There are multiple factors. I think me being here for ten years has been great because I feel I’ve been able to understand The Bay while also understanding myself. Being able to have a consistent group of friends—especially while in my teens to early twenties—in an area I feel comfortable in allowed me to really find myself. I feel like having a place of community makes thing easier as a person. If you’re constantly moving around and in a new city all the time then it’s difficult and you deal with loneliness and the lack of a support system which is necessary for a person. Touching on the concept for the shoot that we did together for this article: although we both had a hand in concepting the idea it was definitely more your creative baby and I wanted to ask you what you feel the color green means to you? What significance has the color green held in your life? Multiple things. I got into the military and workwear style because I was around it so much when I was growing up. I feel that the earth tones that I wear are very calming and relaxing. My style is also a product of being inspired by reclaimed vintage as well as several Japanese designers who pick up these different pieces and rework them. Feeling inspired by these pieces and people was inspiration for my own style. The color green itself makes me feel safe in a way. The color represents nature and brings me back to the earth. But it really comes down to comfort and there are just certain colors and clothes that make you feel comfortable. Different moods for different people I guess. And green is your mood? Yes, green is my mood. You emphasized that these Japanese designers got into reclaimed wears. Do you feel like the trend of wearing vintage military pieces was what resonated with you and brought together your love for the color green and the nostalgia of your youth? I was already into fashion when I found these designers but it wasn’t until I started incorporating more green, military inspired, pieces that I felt like I was getting back to my roots. I started to notice that I felt more comfortable when wearing this color, which was crazy. I had like…an addiction (laughs). I was wearing it all the time! Seeing how all of these Japanese designers were doing it helped me connect the dots for my own style—it came full circle. One question I have to ask. Do you feel like there’s any truth to the term “army brat”? I mean I get that. Do you feel like it’s a real thing? The term itself embodies the perceived idea that moving around from place to place is unsettling and I feel that one would be moody having this constantly shifting lifestyle. Yeah that’s just how it is. I remember when I was in Hawaii I went to a school for about a month or so. I left because my grades were dropping and went to a different school for literally one day before transferring again. Moving from Middle America to a state like that felt foreign was difficult. Yeah I could be a little bratty. For the last question I want to bring the attention back to focus on your work. Could you share your goals for yourself or your work in 2018? I just want to challenge myself. I want to step outside of my comfort zone and be able to push myself for bigger things: whether that’s me working with larger brands, moving to a directorial role, or modeling more. I feel like so much more than just a photographer or designer—I know I can do so much and I want to get involved in different projects to prove to myself and others that I can.